Share "Watering Words of Wisdom"
Spring is the time for preparing beds and planting, and fall's time may be taken up with harvesting and other chores. But summer gardening can be pretty tedious, especially when you hit a dry spell: water, water, water. During droughts, like the ones much of the country experiences this time of year, you want to keep your garden and other plants alive, but you shouldn’t waste water, and you certainly don’t want to spend extra time watering needlessly. So how do you know when to water and how much is enough? Newly planted trees and shrubs need a minimum of 1 inch of water per week. For established plants, if the shoots start to droop or the leaves wilt or curl and don’t recover overnight—-or if you’ve had less than an inch of rain in a few weeks--it’s time to water. Water deeply once or twice a week until the drought ends. Another, perhaps more effective way to measure moisture in the soil is to use a wooden dipstick like the one shown here. Stick a paint stirrer or similar piece of light-colored, unfinished wood through the mulch and into the soil. Pull it up after an hour. If the bottom of the stick looks and feels damp, the soil is moist enough for the plant’s roots. If the stick is dry, it’s time to water. If you don’t have an hour to wait, simply reach under the dirt a few inches and feel the root ball. If it’s moist, you’re okay. If it’s dry a few inches down, the plant needs water. Cleanup Hint: Scrape your fingernails across a bar of soap before reaching into the dirt and cleanup will be a snap. The most efficient ways to water are with soaker hoses or by hand with a hose or watering can. 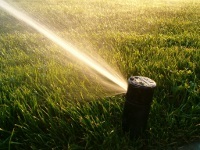 (Using a sprinkler system can waste a lot of water.) These watering techniques deliver water where it’s needed -- at the roots of the plant. If you use soaker hoses, leave them on for about an hour. Then use the dipstick or reach down. Eventually you’ll learn how long you need to keep the hoses on to water your plants deeply. 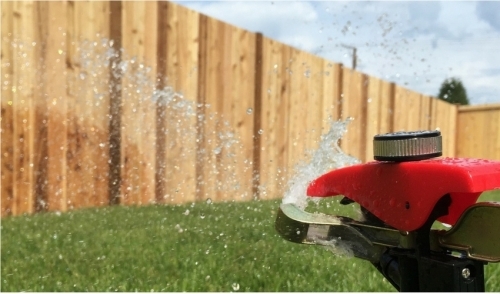 If you prefer to use a sprinkler, you need to monitor it. Set several small containers (like tuna fish cans) throughout the area, and let the sprinkler run until about 1 inch of water has collected in each one. A layer of mulch keeps the roots cool and prevents the plant from drying out. You can use an organic mulch (like shredded bark, grass clippings, or shredded leaves) or a man-made mulch (like gravel). Shallow-rooted plants, such as rhododendron, need several inches of mulch to prevent them from drying out, so pile it on. Add the most mulch the around the drip line of the plant, which is the area below the furthest branches. Don’t pack mulch up against the trunk or cover the crown.